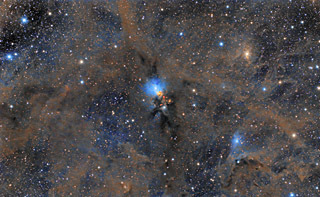 The blue nebulae in this image are areas of dust that are reflecting the light from the hot blue stars in front of the dust. 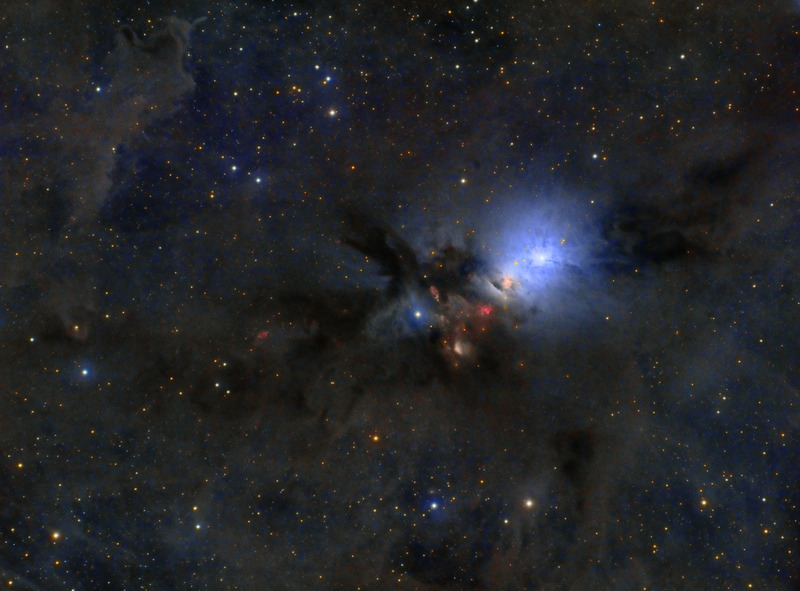 Additionally, this image shows several dark nebulae where the dust obscures the light behind it. This image shows a section of sky roughly 1.1 x .8 degrees. In this image, North is to the Right. Software Used Images Plus 6.0 for camera control, Images Plus 6.5 for calibration, stacking, DDP and ArcSinH stretching, adaptive Lucy-Richardson deconvolution, and star size reduction. Sequence Generator Pro 2.5 for camera control, framing and automated focusing. Plate Solve 2 for plate solving. Photoshop CS5 used for levels and curves, lab color, saturation adjustments, selective color, match color, screen mask invert, high pass filter, and stack blending. Gradient Xterminator for gradient removal. Carboni Tools for additional noise reduction and smoothing. HLVG for additional color correction. Registar 64 for subexposure alignment. Focus Magic for focus restoration. Notes Although I had imaged this part of the sky last year with my Canon 6D, this year I wanted to capture finer details within the main nebula and my new QSI CCD filled the bill. I'm happy with the improvement in resolution as well as the overall look of this astrophoto. This image won first place in CloudyNights' February 2017 CCD Imaging and Processing contest. It then went on to win the CloudyNights' site wide contest for February 2017!